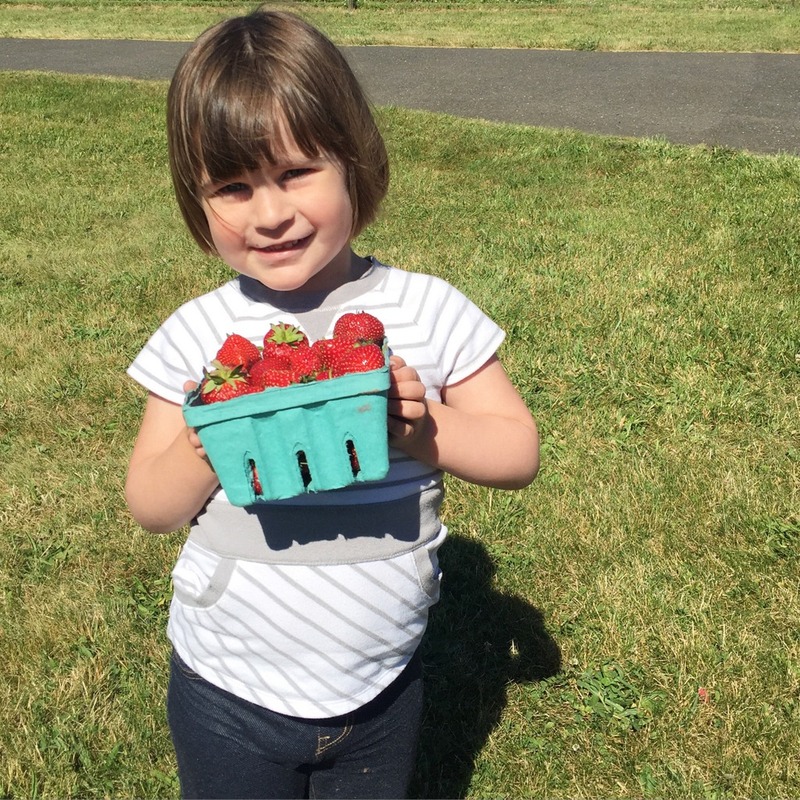 We didn’t go strawberry picking this year, but we did pick up strawberries from Cedar Hill Farm & Nursery, a local farm that sells pesticide-free strawberries. The season has ended here, which makes me sad every year. It feels too short! There has been no jam making yet this summer, but I did put that fruit to good use. 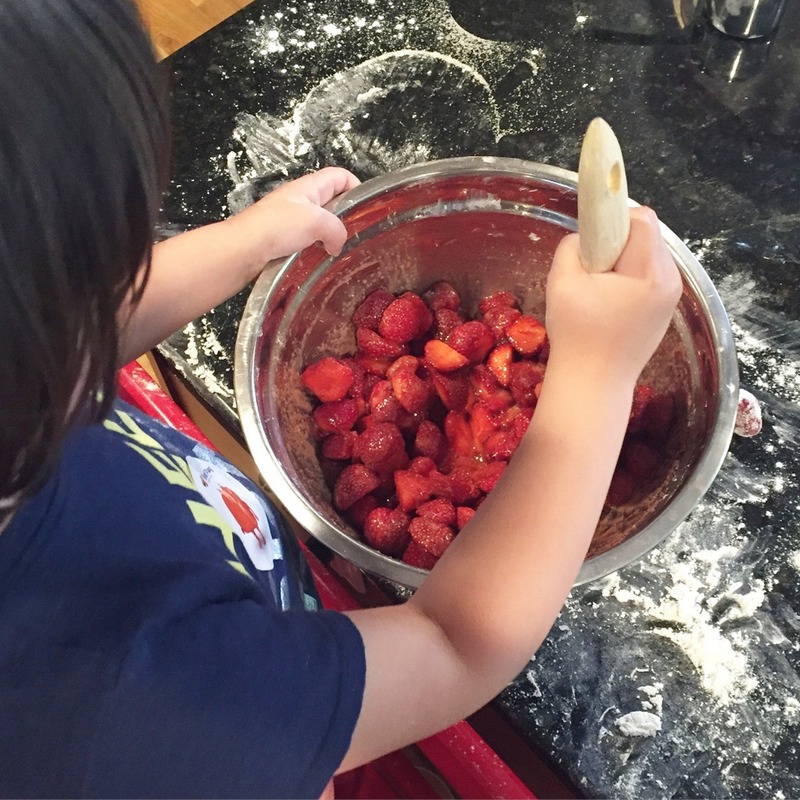 H helped me make a beautiful, gooey strawberry pie. 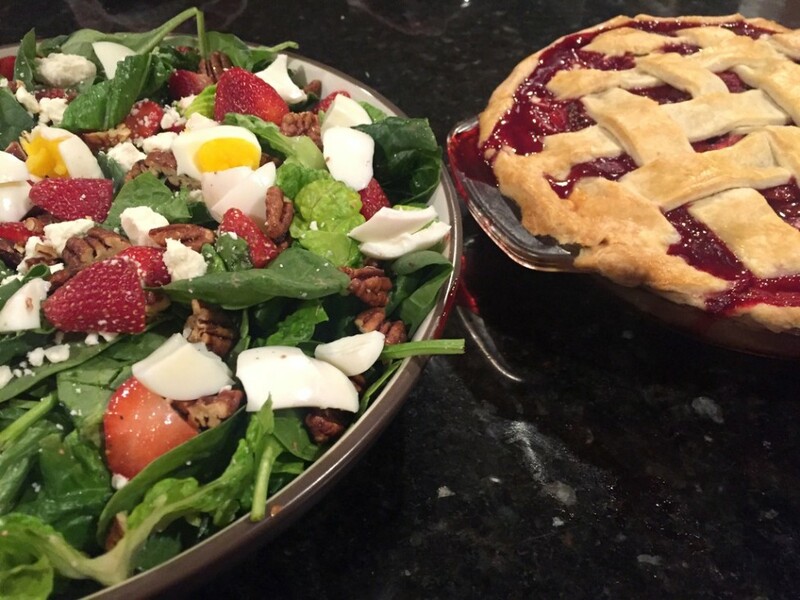 That same night, I made an amazing strawberry salad. I was planning to make this Ribeye Steak Salad from Joyful Healthy Eats, but I swapped out a bunch of ingredients with what I had, and what worked with my plan. I grilled 1 ribeye steak, generously seasoned with salt and pepper, 5-6 minutes each side. Then I cubed it and threw it on top of the salad, but we were too busy eating it for me to take any pictures with the steak. I used the balsamic vinaigrette recipe from Joyful Healthy Eats that was in the original recipe, added a couple of things, and it was delicious. Put all of these ingredients into a mason jar or tall tupperware container and shake until ready. If it’s too thick, add a splash of water. And then you have a fabulous salad! For Father’s Day, I used the last of the strawberries that I hadn’t just shoved in my mouth to make Adam some strawberry muffins from an Ina Garten recipe. Mine look nothing like Ina’s photo, but neither do any photos of these muffins that I’ve found online. Preheat the oven to 375 degrees. Line muffin tins with paper liners (I had some race car liners from a party we never threw, and there was an F1 Grand Prix on that day, so I made these for us to eat during the race. I love any chance to throw together a theme). 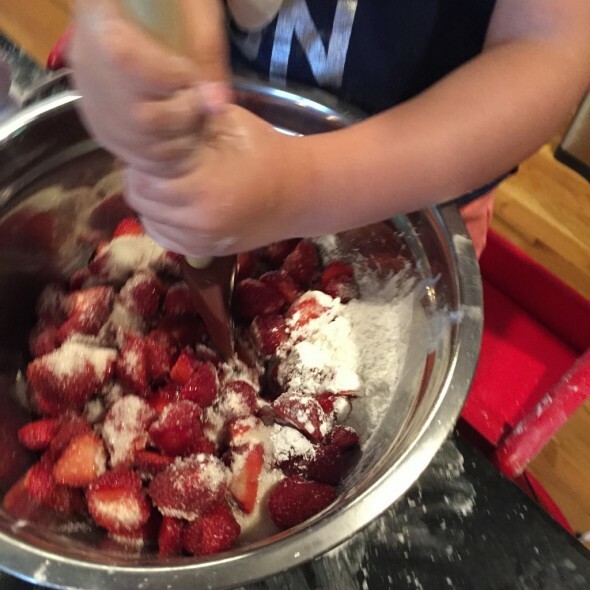 Sift the flour, baking powder, baking soda, salt, and cinnamon together in a large bowl. Stir with your hand to be sure the ingredients are combined. In a 2-cup glass measure, combine the milk, eggs, and melted butter. Make a well in the middle of the dry mixture, pour the wet mixture into the well, and stir until just combined. There will be some lumps but don’t overmix the batter! 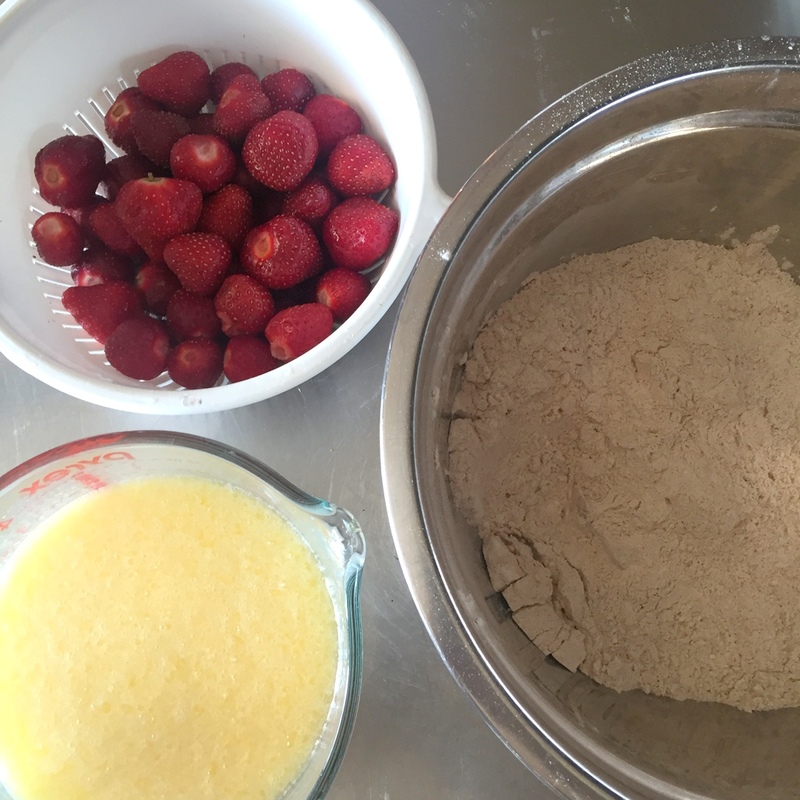 Add the strawberries and sugar and stir gently to combine. 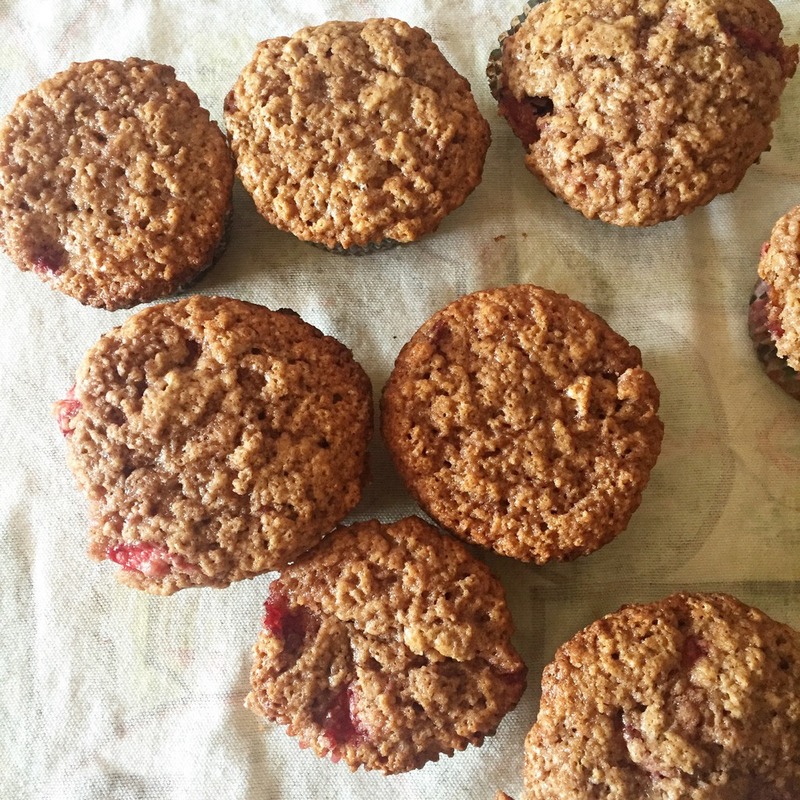 Using a 2 1/4-inch ice cream scoop, spoon the batter into the muffin cups to fill the liners. Bake for 20 to 25 minutes, until a cake tester comes out clean and the tops are nicely browned. And that was our short, productive, delicious fresh strawberry season this year.